If you have ever seen a tilt-up project completed or even drove by a building that was being tilted, it is an interesting and exciting process. The tilt-up process is a relatively simple process, the walls are constructed on the ground and once complete they are tilted into place. Once the roof structure is installed the building is essentially done. The insulated tilt-up process is one of the fastest methods of constructing buildings of this size. As mentioned previously, once the walls have been constructed and tilted in place and the roof structure is on the building is essentially finished. For a developer that is interested in getting a building constructed and leased out as soon as possible, they should seriously consider the insulated tilt-up option. The insulated tilt-up method of construction is a great option for a building envelope that allows minimal heating or cooling loss. 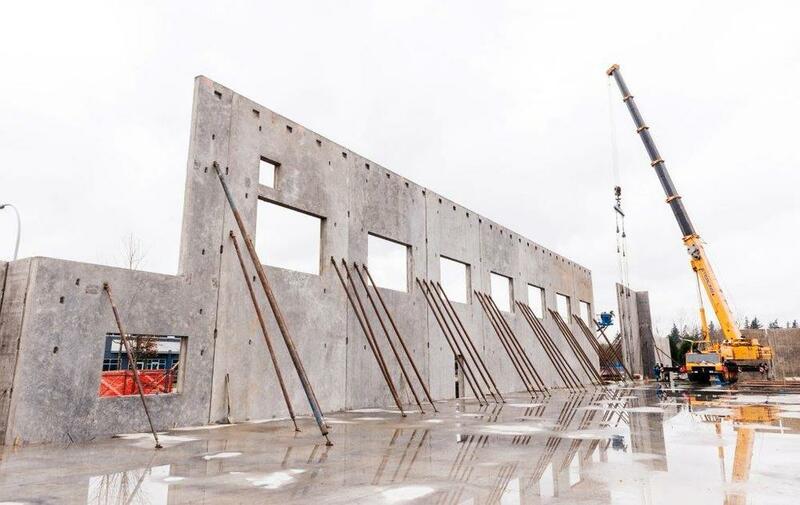 The fact that the insulation is installed inside of the concrete panel after the first concrete pour means that a continuous insulation layer can be provided, something that is required by ASHRAE 90.1. The continuous insulation layer with almost no thermal bridging means that the heating and cooling within the building is highly efficient. The insulated concrete tilt-up panel has a concrete layer on both the outside and inside face. The concrete surface is highly resistant to damage and scratches and marks on the wall are relatively easy to repair. For a warehouse application, an insulated tilt-up project will provide the longest lasting application and offer the most mixed use options. Tilt-up offers a variety of other advantages including cost savings and fire resistance. The practice of tilt-up is rumored to date back as far as Egyptian times and with the advances we are currently seeing in insulated tilt-up technology, the process is not going away soon. Insulated tilt-up panels for homes is another use of tilt-up panels which is beginning to gain some traction. If you are curious to learn more, I recommend you take a look at www.nzbuilders.com to get an idea of what a home created from insulated tilt-up panels can look like. The Tigerloc system saves cost on any insulated tilt-up by removing the need to purchase or custom cut insulation to a tapered edge at openings. This can easily result in a $10,000 to $15,000 savings on your next insulated tilt-up project. For more information or to order our system, please use our contact us page to get in touch.